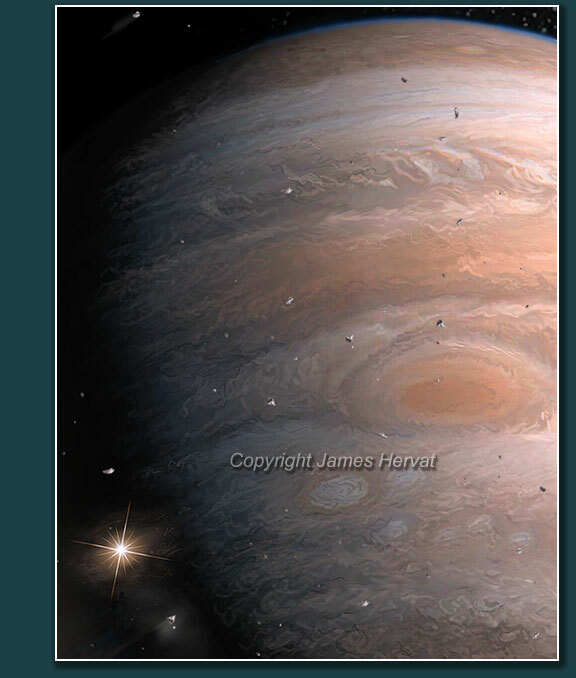 Jupiter under Siege by James Hervat - Jupiter is bombarded by fragments of the shattered Comet Shoemaker-Levy-9. Jupiter under Siege (2007) - The renowned team of comet hunters of Gene and Carolyn Shoemaker and David Levy noticed an especially odd image on a photo taken in March of 1993. It appeared comet-like, but it was strangely elongated. Hubble images showed a train of twenty-one individual components imbedded in clouds of dust. 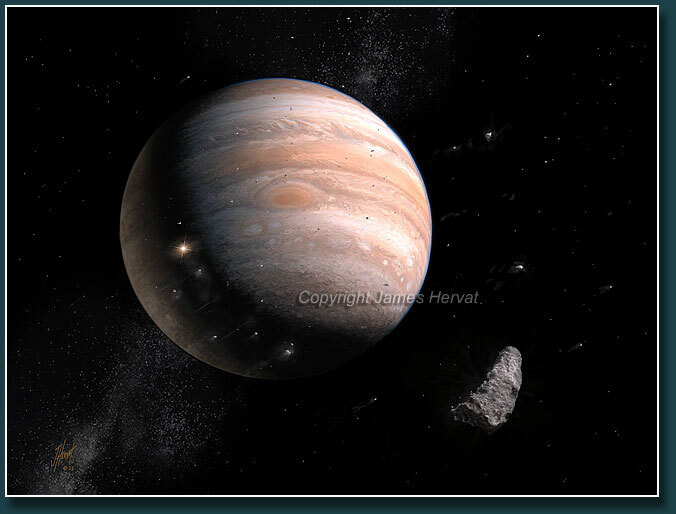 The object was discovered near Jupiter and was orbiting the giant planet. It was determined that it was indeed a comet and that it had wandered too close to Jupiter and was torn to pieces by the planet's gravitational pull. Even more remarkably, further observations of the comet's orbit indicated the string of fragments would collide with Jupiter in July of the following year. No such event had ever been observed on an extraterrestrial body (it would had to have been by pure chance), and now astronomers had the unheard-of good fortune of an advance notice. The predicted day of impact arrived. Telescopes around the world were aimed and waiting, along with the Hubble Telescope and the Jupiter-bound Galileo spacecraft. The impact zone was on Jupiter's far side, just out of view from Earth, but Galileo was positioned to view it directly (albeit from a considerable distance). With no observational precedent for such an event, predictions of what would happen varied, with the most conservative being that nothing would be seen--such minuscule cometary specks could have no discernable effect on such a huge planet. This proved wrong. The arrival of the first ("A") fragment was announced by an immense, brilliant fireball. Hours later Jupiter's rotation carried the impacted area into view showing a dark, ruddy scar on the cloudtops. As the other fragments made their suicide plunges over the next few days, more fireballs were observed. As Jupiter rotated under the barrage, the impact scars formed a chain across the planet's southern hemisphere. These could easily be seen through the most modest backyard telescopes. We are unlikely to see another such event in our lifetimes. If we do, let's hope our own planet is not involved. Artist's notes: This image shows the impact of the "A" fragment. I am not sure I have depicted the correct Jovian longitude--I did want to include the Red Spot. As I often say: "This is art--you can do that!". NOTE : the watermarks seen on the above image do not appear on the prints.